*Students must be picked up by 5:30 to avoid a $5.00 late pick-up charge. Full time and part time options are available. 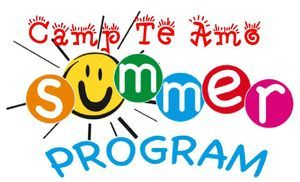 Camp Te Amo is a ministry of Guardian Angel Christian Daycare. We are enrolling students ages 5 thru 5th grade. Our summer program is filled with fun activities, field trips, water days and more! Breakfast is provided and served from 6:30am-8:30am. Students should bring a sack lunch and non-carbonated drink from home each day. Afternoon snack is provided.